If you want to get your cardio health on the upswing and make your leg more powerful then the best rowing machine of 2019 is for you. A rowing machine is a great exercise equipment. When you think about a workout machine, typically the four major pieces of equipment are the treadmill, elliptical trainer, stationary bike, or a recumbent exercise bike. Very few people consider the benefits of using a rowing machine and much fewer people understand how to use it in the first place. But if you’re searching for a good exercise machine that you can do workouts just about any time you want, the best rowing machine should just be right up your alley. Rowing machine provides an excellent way to increase fitness by building muscle and burning calories in a safe, comfortable and low-impact way. 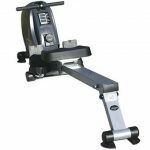 There are different styles and features of rowing machine brands available in the market. As we know, high quality comes with the high price, but there are reliable and great rowers at lower prices too. Choosing the best one might be little difficult. But no worries, we are here to help you if you’re on the hunt for the perfect rowing machine. Rowing is a great workout due to its low-impact activity. But before purchasing a rowing machine always consider the three things like the type of workout you want, the mobility, and your budget. We have listed top 10 rowing machines that would be a great asset to your sweet home gym. 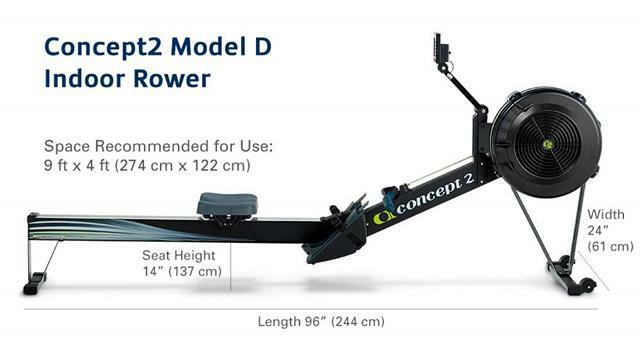 The Concept2 Model D is the best selling rower machine in the world. It is fully equipped with a performance monitor. This exercise machine is loaded with preset workouts for convenience and tracks all stats. The Concept2 Model D tracks all stats. You can transfer this stats data to a computer device with USB to track your fitness goals easily. 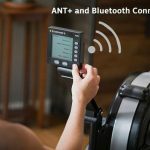 This is a Bluetooth compatible rowing machine for heart-rate monitoring. The seat of this rowing machine is made from firm-rubber ergonomically which is very comfortable. The footrests are adjustable and the handles of this exercise machine offer a smooth grip. Concept2 Model D Indoor Rowing Machine is designed to endure up to 500 pounds weight capacity, while most rowing machine brands max out at a 300-pound. This best indoor rowing machine takes up a space of 4’ x 9’ but quickly divides into two pieces for storage. You will also get wheels for a zippy move! Stamina Body Trac Glider 1050 is a unique rowing machine. It offers a full range of motion rowing mimics being on the water. You will get a multi-function electronic monitor to make you motivated. It is featured with Comfortable molded seat, Adjustable hydraulic cylinder resistance for a smooth rowing stroke, foldable arms for compact storage. To keep your feet secure it has textured footplates with straps. It is designed with sturdy steel frame construction and foam padded hand grips for comfort. This best indoor rowing machine is very quiet and smooth, you will not have any problem hearing any movie sound during workouts. Most important thing is it works up a good sweat. One customer said that after using this exercise machine his arms are more shapely and a little bigger. And he lost some belly fat. As far as weight loss he has lost about 4 lbs just under a month. He used it every day, initially for 15 minutes only. He is very pleased with this rowing machine. It was well packed and very easy to assemble. That tells all the story of Stamina Body Trac Glider 1050 rowing machine. It is a great low priced rowing machine but it has all the bells and whistles that anyone on a low budget could need. The high weight capacity Sunny Health & Fitness SF-RW5639 will help you to achieve your fitness targets. You can easily Increase or decrease the exercise intensity with an easy turn of the resistance knob. Its full-motion movement feature of the arms will burn up more calories. You can boost your strength by connecting more muscles in the shoulders, back, and core. It has got extended 350 lbs weight capacity, 12 Levels of adjustable resistance, and digital LCD displays for watching time, scan, count, and calorie. 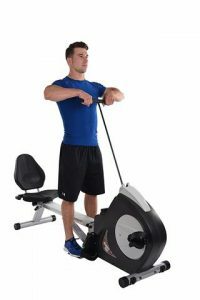 It has also got a fully padded seat and nice non-slip grip handlebars of this rowing machine provide optimal comfort and support. For secure footing, you will get large anti-slip foot pedals with foot straps (adjustable). 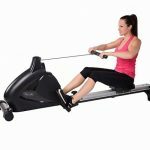 If you like exercising early in the morning or at night while the kids are in bed, or maybe you want to hear the TV rather than the buzz of your equipment, you will be happy with this best silent rowing machine. This rower is equipped with 12 different workouts for those who like to switch up their fitness routines or want the choice to modify their own. Thanks to its delicate magnetic resistance, this magnetic rowing machine can help you get in shape or train for the real fitness by performing your stroke. The LCD screen allows you to stay updated on typical readings: pulse rate, number of shots, the time taken, calories burned. The weight capacity of this indoor rowing machine is 275 pounds. The Orbital Rower 35-1215 is a great choice if you have a small space. This is one of the best indoor exercise machines that can hold up to250 pounds. The pivoting footplates make mobility easier and a thick padded seat allows users to enjoy their time on the rowing machine. This home rowing machine is equipped with a monitor that shows the speed, the time, the number of lines, the distance, the calories burned and the kilometers traveled. It’s a compact rowing machine with full range-of-motion rowing that mimics rowing on the water. 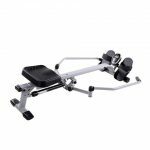 This best indoor rowing machine offers smooth hydraulic cylinder resistance, adjustable tension controls, thick, padded seat and pivoting foot plates. The Single button monitor of this device shows speed, time, distance, calories burned, row count, and miles rowed. Compact and portable (it occupies only 32.5 “x 48”) and weighs 47 pounds. You will get a 5-year warranty on frame and 90 days warranty on parts. I love this indoor rowing machine model. The ash wood finish is simply beautiful to look at. The steering wheel is horizontally placed “under” the machine, instead of vertically at the end which gives WaterRower a compact, discreet and beautiful appearance. I mentioned that this is a steering wheel design, and that is something that many rowing machines have in common. However, this is of a different type from our previous entry, as WaterRower gives away in his name. This uses a tank full of water, in which the steering wheel is contained. The WaterRower comes with the S4 Monitor, a monitoring package similar to the PM5. The fact is that, although similar, it has some drawbacks. The screen is much less clear and precise, it looks a lot like a bad LCD screen. It is not as easy to read as the PM5 design. It is useful enough in its functions, it offers similar metrics, but it is simply not easy to read during the exercise, and that is a negative point. It is not a decisive factor, but it disappoints a little. The Stamina 15-9003 Deluxe is an interesting beast, it is designed to offer two different types of training in a single package. This is not uncommon in the world of training machines: the legendary Bowflex exercise machines are famous for offering a variety of different exercises in a single stand. The Stamina DC-II only offers two, since both take advantage of the basic design of the steering wheel. The core of the machine is a rower, as one would expect to be given the subject of this article! However, it also comes with a pair of externally mounted pedals, which means that it can also serve as a recumbent stationary bicycle. The advantages of this type of approach are obvious; A machine that fulfills two functions means that it occupies less space than having a dedicated machine for each one. However, I emphasize that it is for less dedicated training enthusiasts. Machines do their best work when they specialize in a particular task. The compromises necessary to make a steering wheel that supports both the movement of the bicycle and the rowing movement mean that it will not excel in either. A competitive amateur or professional fitness enthusiast will not find as much love on this rowing machine as someone looking for a convenient way to combine two workouts. 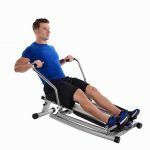 The price of the Stamina rowing machine is also a bit more than what you get, obviating some of the advantages of buying a combined machine. Stamina Avari rower is a programmable magnetic rower that comes with a heart monitor with a chest strap. This rower machine is correct against the heart, so it can measure cardiovascular function and respiratory performance from the source. Unless you stick electrodes directly on your heart and lungs, which I think we can agree on, it’s probably not the healthiest option, in my opinion, this is the best way to get accurate rowing results in relation to the performance of her body. Stamina Avari has a blue backlit display that shows its performance metrics, and since the resistance of this device is not driven by its own efforts, you can adjust the resistance level by “workouts”. Let me explain to you; If the resistance is adaptive, and increases depending on whether you adjust the machine and the intensity with which you row, the whole impulse for training depends on your own focus. This makes it easier to enter the furrows or cheat a bit by doing the same exercises. A magnetic device can adjust the resistance during its training routine, since the monitor can change the resistance on the fly, so to speak. This allows the PMER to store 12 different training routines and 4 routines that the user can design on their own. I like this kind of programmable routine since it allows me to “turn off” my brain a bit and simply work on the routine without stopping to make adjustments. The PMER has the same drawbacks as other magnetic devices; it needs a constant power source, it’s quite bulky to take the magnets into account, and it’s not as intense at the higher end as the water or air resistance designs. In addition, the screen seems a little lackluster. The computer works very well as a monitoring device and the programmed exercises are very fun. However, the screen is curiously difficult to read mid-training for a backlit device. This First Degree Fitness Rower is an amazing machine. It looks so unusual, with its bright primary colors and its very prominent water tank. That said, I liked the aesthetics of First Degree Fitness Water Rower. It has a different appearance, which does not apologize for being unconventional. Of course, that would not matter much if it did not work well. I have seen a lot of teams that look very good but in the end, they fall short. Fortunately, that was not the case here. I really enjoyed the AR Rower. As the title says, the AR is a water resistance machine and uses a horizontal low water tank similar to the WaterRower that we discussed earlier. It is a much more prominent machine, however, with a much more robust metal frame. You can flip it and store it easily, but it is a substantial beast even in a vertical posture. This best rowing machine of 2019 deserves a dedicated space. Also, it may sound strange to compare AR with other water rowers because the water is water, but I really liked the sound of the machine as I used it. It’s a bit noisier than the WaterRower, but the sound sounded so natural that I ended up enjoying it. It seemed like I was really rowing. I also appreciated the USB connectivity for computers running fitness applications, which allows for an easy connection to the online monitoring of my training. There are some peculiarities that I did not like, of course. The water provides a degree of dynamic resistance, but eventually, you have to adjust a dial to increase or decrease resistance levels to suit a workout. This would not be so bad, but the change in resistance was delayed a bit; It often took me a minute to feel the change in the levels of resistance, which disturbed my rhythm a bit. That said, it’s a comfortable ride and the fixed foot surfaces meant balance problems that never affected my paddle. 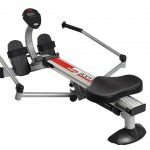 This LifeSpan rowing machine offers a very simple design; Your body does all the work of moving the wheel while you row. It is a simple design and not prone to breakdowns, lifting dust that accumulates on the wheel and does not need tight water levels. It is a very simple machine to assemble and put. The LifeSpan paddler is not as quiet as the magnetic resistance models and does not have the smooth, pleasant “whistle” of a water rowing machine. However, he is still very calm, with a small, quiet “buzz” of activity while he trains. It’s definitely not a noisy machine, and I like any machine that does not distract me from books or listen to Cheap Trick when I’m exercising. That said, no review article is complete without an honest look at the problems in a machine, and this one had some issues that I have noticed. First, the maximum user weight of the LifeSpan machine is set at around 300 lbs. Now, with an average weight of around 200 pounds, it’s not a big problem. However, rowing machine workouts are some of the best workouts for people who are overweight and determined to lose weight. This top-rated rowing machine is ideal for people who have joint problems and similar problems that come from excess weight. This low threshold puts you out of the race as a weight loss machine for severely overweight people, and that is a problem worth noting. Since this is the central function of the machine, it gives me a little pause. It will not fray and break even in a year of use, but it does put a definitely longer maximum life in the machine than it would have a more resistant option. Unless you have been on a rowing machine and feel that the exhaustion starts almost immediately, you probably are not aware of the full effects of this machine. Below are some that you may not have considered. Treadmills, stationary bicycles, Stairmasters, and machines of that type generally only work with the legs; Very few engage their core or their upper body at all. With a rowing machine, most of the training is within the muscles of the leg, but a considerable amount of energy is also consumed through the arms and shoulders. Not only will a rowing machine work your body, but also your cardiovascular system will get in shape, making it the ideal equipment for a good physical condition. To make the rowing machine correctly, you must maintain the proper form. In this way, spending time on a rowing machine will help with your general stance outside the machine as well. Unlike some machines, a rowing machine will not put unnecessary stress on your joints, making it perfect for older people or with pre-existing health conditions. Despite the relative simplicity of the rowing machine, there is considerable variation between the different types. Below are the most common types. These are by far the most popular type of rowing machine on the market, mainly because they are cheap and easy to fold in a closet or under a bed. If you have an apartment, they are even more ideal. As the name implies, these rowing machines are operated by a set of hydraulic pistons on each side that allows the user to pull the handles towards themselves. Although it is classified as a rowing machine, it is not a true representation per se, as there is little or no leg movement involved. While these are excellent if you’re in a hurry, they do not provide the full range of motion you’d want in a traditional rowing machine. Nor will it provide you with full synchronization, which means that your legs and arms do not necessarily work in sync. For that reason, unless cost or space are important considerations, it is better to consider a higher model. If you are looking for a rowing machine that offers a decent amount of resistance but does not want to spend the money needed on a traditional rowing machine, magnetic resistance may be the way to go. 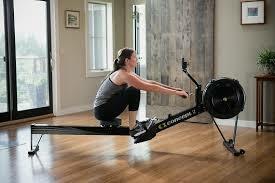 These rowers online work the same as other machines but offer a great advantage: total silence. Magnetic rowing machines have magnets that are built into the flywheel to generate resistance, instead of air or water like other machines. Since there is no friction involved and minimal parts moving, the magnetic rowing machine provides virtually silent training. These became important in the 1980s as a way to provide the benefits of water-based rowing to a home audience. Instead of magnets, air rowers use a set of internal ruffles that rotate in front of each other and create resistance. The faster and harder you pull the wheel, the more resistance is created and the harder the training. 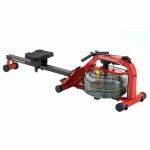 Air rowers offer a type of training very similar to traditional rowers, but they can be considerably noisier than other machines. It has the ability to automatically adjust to your stroke rate, so you can increase and decrease the speed as desired, and with minimal friction, you must also have a long life with minimal wear. If you are looking for the best rowing session, regardless of costs, space or noise considerations, there is no substitute for a true rower of water. Instead of air or magnets, a true water resistance is used to generate the training; Ironically, aquatic rowers are some of the most recent innovations in the line of rowing machines. The water rowers are built with wooden or metal frames, which makes them much more attractive than other options. They are also almost silent since there is practically no friction either; the only sound is the “swooshing” of water. Many people love this silent feature of this water rower machine. The main cons of a paddle are two the cost and size. Water rowers are basically costly than any other rowing machine on the market and also occupy most of the space in a room. So unless you have space really dedicated to a gym area at home, it might not be a good option. How much money you’re going to spend will determine which type of rowing machine you’ll be able to purchase. Expect to spend over $700 for a good water rower and less than $200 for a good hydraulic rower. Each rower is different in its own way, especially between brands, so do research to determine which type of rower you actually need, as well as which company makes the best rower within each category. Before buying the “Best Rowing Machine Of 2019” you need to consider that whether you can leave your rowing machine out there all the time or tuck it away when your workout is done. Based on your space you have to select your machine. If you have space in your room then magnetic and hydraulic rowers would be the best option for you. Though a rowing machine is not able to replace all of your exercise gear, when used effectively, it should provide a substantial boost to your regimen and work out your body in new and challenging ways. 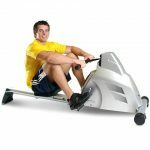 Fitness experts and health professionals agree that the best rowing machine provides the best workout training possible. Exercising in a rower will allow you to target the vast majority of your muscle groups and give them training as hard and challenging as they want. On the best models of rowing machines, you can track your progress and see how your divisions are improving. As discussed above, the great advantage of the rowing machine is that it provides more than just cardio training. It will help you to lose weight and build muscle fast. Compared to a treadmill machine, the rowing machine works at most of your body parts. It will really affect the shoulders, the quadriceps, the core, the hamstrings, the arms, the buttocks, and the back in an effective way while having a low impact. Thus rowing machine reduces the stress on the joints and give you great comfort and makes you relax. Larger muscles need more energy and will burn fat to obtain it, which of course leads to a healthy weight loss. In general, you should choose that rowing machine which fits your budget and adapts to your body, heart, muscles, and mind. So, Just purchase a rowing machine get on it an start rowing. Best of Luck!